Live in a penthouse apartment and feel like you’re living in a large luxury house. With 575sq. feet of terrace and over 3100sq. feet of interior living space most people would agree this unit feels more like a private home than an apartment. 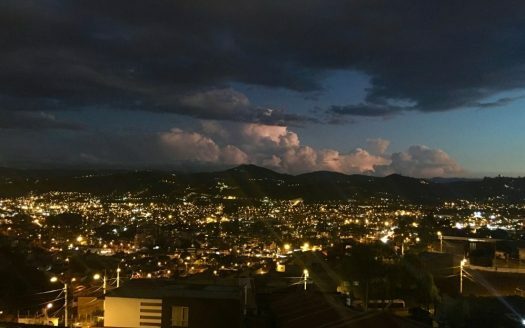 Anyone that has lived in Cuenca for awhile knows that El Vergel really is the most convenient location in Cuenca while also being one of the safest and quietest. Located almost dead center between Cuenca’s two most beloved rivers I refer to the residential part of El Vergel as the “Oasis” inside the city. 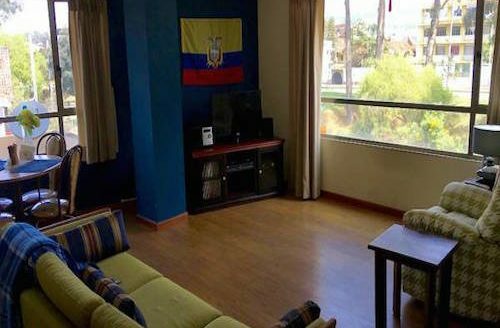 Being in Vergel the apartment is only blocks from Supermaxi Vergel, Parque de la Madre, Millennium Plaza, top tier hospitals, delicious restaurants, banks and more! And most importantly within just a short walking distance is Cuenca’s beautiful colonial district- El Centro. The entrance into this elegant 3 bedroom, 4 1/2 bathrooms apartment is through its own private elevator access into the open concept floor plan of the dining room and living room. The living room, which has constant light all day, leads out to one of the large terraces that flows over the Kitchen. The dining room even has a beautiful mural commissioned by famed Cuenca artist, Cristian León. The kitchen, which also has access to the terrace and views of the cathedral, has granite counter-tops, stainless steel appliances, and ample lighting. The kitchen appliances all stay with the apartment and other furnishings are negotiable. The grand, master bedroom has views of Turi to the south and the Cajas Mountains to the west, plus an unrivaled master bath with porcelain and mosaic tiles, a custom-built hydrotherapy tub, and an extra-large shower. Windows in the Master Bedroom and Bath are double-paned Termotec, for sound reduction. The main floor also includes an office/study with a view of the New Cathedral, and a second bedroom, and a bonus TV room that includes an en-suite bath. There is an additional social bath on the first floor. The second floor is designed as separate living quarters for guests or renters, with a large bedroom, bath, sitting area and second kitchen which opens onto a glorious rooftop terrace, with spectacular views. In addition to a beautiful pergola, there is also an automatic watering system on the upstairs terrace, so plants can continue to be watered — even if owners are away! The penthouse has garage parking for two cars and comes with a large bodega. Penthouse Apartments in this neighborhood almost never come available and especially not penthouses like this one! Don’t let this opportunity get by- Call today and schedule a showing!